Apparently Black Pearl is the polish that started the "pearl" trend for Lilypad Lacquer. I actually can't find it on the Color4Nails or Lilypad Lacquer websites right now, but I thought it was a core color? I'm not 100% sure if it's going to be back or not. Had I known it was going away, I would have posted this color ASAP. I'll let you know if I hear anymore information. Black Pearl is a bit of a grey base with lots of holographic purple sparkle. I dunno, it seems more pink/purple than "black pearl" if you ask me. Either way, it's a beautiful polish. I didn't use the light diffuser for the photos above to show the holo finish. In most indoor lighting you won't see much of the rainbow effect. The formula was fantastic, but it was a bit sheer and needed 3 thin coats for full coverage. Whimsy is a bright blue holo with flashes of pink shimmer. While looking through the swatches on the Color4Nails website, I didn't notice a ton of bright colors from Lilypad Lacquer. Once I saw Whimsy, I knew it was going in my basket. I ended up buying 5 polishes in total, and Whimsy was the most pigmented out of all of them. It also had a smooth formula, and only needed 2 coats to cover any visible nail line. Again, you can puchase straight from their website or Color4Nails. Cosmetic Sanctuary has a 10% coupon code for any purchase from Color4Nails, so make sure to use that if you order (code CSant10). If you don't live in the US, check their website for stockists in other countries. 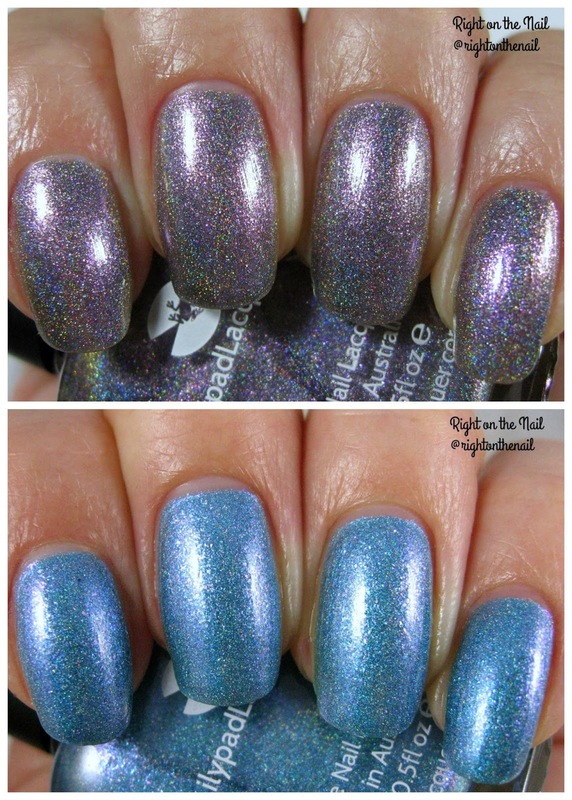 Whimsy is still on the Color4Nails website for $13, but I'm not sure the status of Black Pearl. You can find out more information on their Facebook and Instagram pages.